The Portland Thorns goalie was voted NWSL Player of the Week for week 14. Adrianna Franch received NWSL’s player of the week after performing 11 saves during games against the Seattle Reign and Sky Blue. The 27-year-old just recovered from an MCL injury and returned to play against the Sky Blue last Wednesday. Franch came back with vengeance, performing three saves throughout the game. She continued to strive for excellence in the Portland Thorns game against the Seattle Reign on Saturday. The goalkeeper captivated audiences with an astounding eight saves as she defended against the Reign. 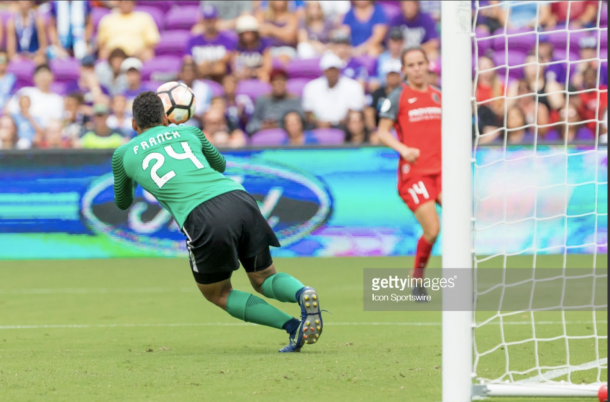 She even managed to earn the Save of the Week during her game against the Reign after Megan Rapinoe took a right footed shot toward the right side upper 90; Franch leaped to the right corner to seize the ball and protect her goal. Franch returned without ease, as she immediately played two 90-minute games upon her recovery. She wasted no time reacquainting herself to the field and managed to return from injury far stronger than most players would have. Adrianna Franch’s saves were anything but simple. All saves consisted of perfect timing, position, and skill that were incredible to watch. The goalie is also quick on her feet, which aids in her ability to move effortlessly throughout the box. 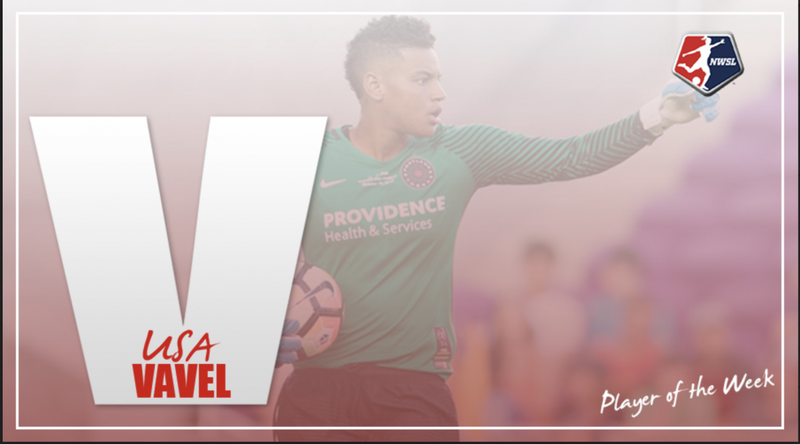 Franch is the third goalkeeper, as well as the first player from the Portland Thorns to receive Player of the Week this season. Franch is from Salina, Kansas and attended Oklahoma State University, where she played as a starter for all four years. Her college team made it to the NCAA Tournament in three out of her four seasons. The goalie had a total of 325 saves over her entire college career. Franch was named NWSL goalie of the year and Team MVP last year. She also started 24 matches and ended with a record of 14-5-5 for 2017. Franch has had experience with the U20 and U23 National Teams and received a call-up to the USA Women's National Team in January. However, she has yet to earn an international cap for the senior team. With the USA Women's National team goalie position fairly open, earning Player of the Week will help bring attention to Franch that could help her earn the position in the near future.